The modern Challenger mission will involve 16 global-class autonomous underwater gliders that will be flown on coordinated flights covering 128,000 kilometers around the five ocean basins. These underwater gliders will be outfitted with payloads that sample the most energetic currents associated with the basin scale gyres. Additional gliders owned and operated by other institutions around the world will be able to join in the mission by contributing their glider’s real-time data to the global portal. The data gathered at the main Operations Center in New Brunswick, NJ, and in locations around the globe, will assess the capabilities of the currently active global ocean forecast models and provide a new, real-time datastream to further improve the forecasts through data assimilation. 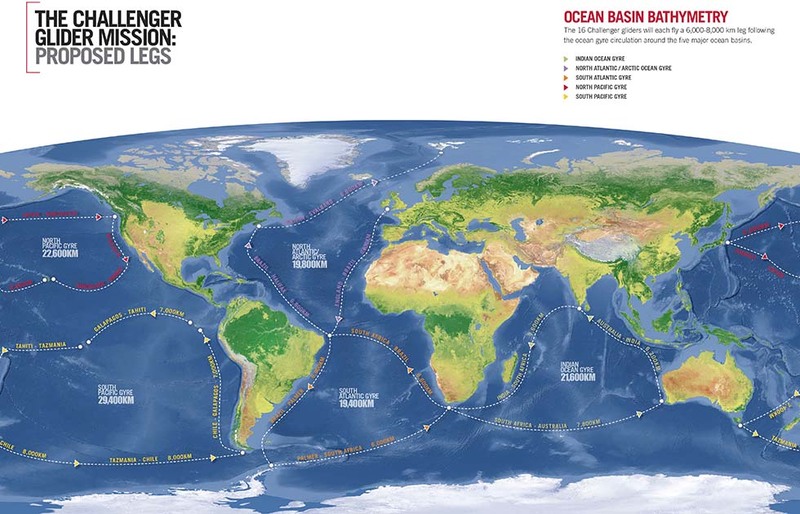 The mission will kick off at the Oceanology International Conference in London in March of 2014. Gliders will then be dispersed to their launch points to begin flights along their designated legs. After completion of the flights, the crew will reassemble at Oceanology International in London in March of 2016 to mark the 140th anniversary of the return of the HMS Challenger.